To escape the ghosts haunting them both, his older brother had launched his own club, filled with veterans and soldiers. His brother’s stories about his members set up a longing deep inside him, and Mike found himself reaching towards the forgiveness and peace his brother had found. But, in an atmosphere drowning in blood and hate, peace was hard to find. 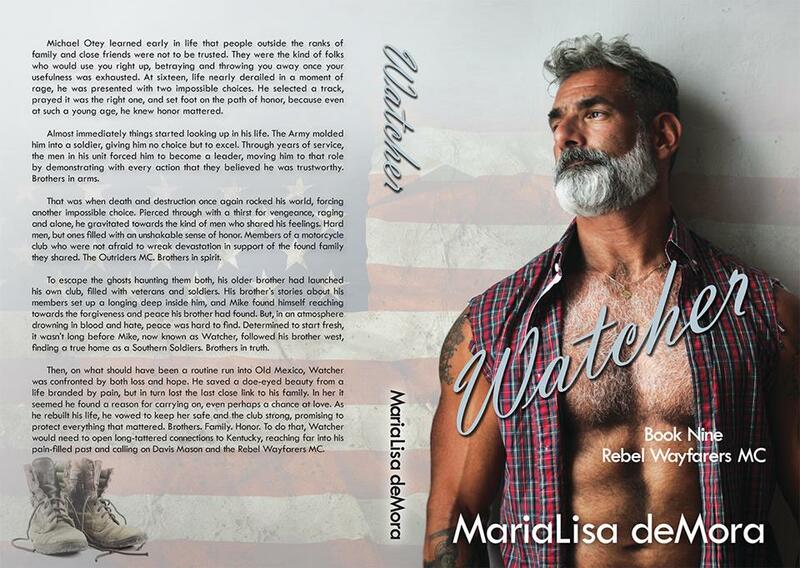 Determined to start fresh, it wasn’t long before Mike, now known as Watcher, followed his brother west, finding a true home as a Southern Soldiers. Brothers in truth. Fifteen-year-old Michael Otey stood at the top of the path, shoulders back, long arms relaxed at his sides. His ma promised he’d grow into his reach soon, said Mikey just had to be patient. From where he waited, right where the path doglegged sharply, he could see the pitch in the grade as the dirt track plunged down the steep mountainside towards the holler. He was watching his pa and one of their neighbors walk the trail that led towards the mine entrance. Not quite dawn, the early light streaming through the fog-filled air created odd shadows, making the men appear as dark silhouettes—featureless and eerie when glimpsed through the trees. His pa turned just before the path crooked at the bottom of the hill and waved, one long arm extending far over his head and holding there until Mikey waved back. Turning and jogging five long strides off the path and into the woods, Mikey oriented himself, then set off at a steady trot back home, staying off the path for this leg of the trip. Eyes down, he scanned the ground ahead and to either side, occasionally stopping to collect black morel mushrooms growing from the hillside. Practiced motions allowed him to leave the roots intact, the soft stems of the black and gray fungus falling to the pinching pressure of thumb meeting fingertip. Elbow tucked inside the bag slung over his shoulder, Mikey cradled the mushrooms in both hands as he opened the container and placed them inside. With a self-satisfied grin, he allowed himself a moment of pride at the haul he would be dropping on his mama’s table in about five minutes. Morels were a cash crop on a good week and a stew-stretcher on a bad one. She would be well pleased because most of the ‘shrooms were big and clean. In the barn later that afternoon, he’d been working his way through the daily list of jobs, and was measuring out chicken feed. This was normally Tabby’s chore, but at only six, she was too short to reach the bottom of the barrel, and was prone to lean too far, tipping herself inside. So, when it was nearly empty, as it currently was, dipping out a scoop or two of grain on her behalf was far easier than retrieving an angry little sister from the depths of the round prison. It hadn’t happened often, but for him even once was too much, so if he were in a place to do so, he would meet her in the barn of an evening and help fill her bucket. Mikey was head-and-chest inside the barrel, scraping down near the bottom, having tuned out her little voice ratchet-jawing away above him. Tabby was jabbering animatedly about a dolly she’d seen in the mail-order catalog and how her birthday was only four months away when he felt it come over him. A spine-tingling strangeness washing through the air like soot before a storm. Then Pa’s old mare squealed. The normally sedate horse kicked out hard at the walls of her wooden stall, the sounds she made were both sharp and dull at the same time. The earth underneath his feet stretched, jolting everything in the barn. It set the tools hanging from the long wall jangling discordantly against each other. Thinner metallic pings of hay tongs fighting against deeper gongs from shovels and rakes. Rattling and tumbling off the wall, falling in an awkward heap along the edge of the floor. Tabby’s voice, raised in a shout, quickly cut off. As fast as the ground had lifted, it seemed scarcely a breath later when it fell back into place, the shudder that accompanied it moving through Mikey’s bones, setting his teeth to aching as it tumbled him into the barrel headfirst. He pressed his hands to the sides of the container, legs kicking, arms working to edge himself backwards. He had barely extracted himself from the barrel when Ma ran into view, coming to a halt in the barn doorway. Chest heaving from her sprint from the house, her eyes were wide and nearly as frightened as the mare’s, showing whites all around. “Mikey,” she half screamed, half yelled, “you see to Tabby. I’ma goin’ to the mine.” She didn’t even wait for his response. She simply whirled on her heel and then raced away, long legs eating the distance, toes flying out in front of her to punch down into the ground. Then her knee lifted and she hit her stride, the kick of her muscles driving her on again. He stood and stared at the slowly swinging door for a long time. Long after she was out of sight. Long after Tabby had gone quiet—questions lodged in her throat as the seriousness settled onto her. Long enough for the siren to cut off, winding down to a silence more painful than the whistle had been.